This article was written to tie together and summarize the various papers on unvented conditioned cathedralized attics found on our website. We realize that there is a wealth of information, and much of it too detailed to understand or digest in a single sitting. Furthermore, building officials might not have the time available to carefully examine the many documents on the page; this is meant to summarize the main arguments, and provide pointers to where detailed information and measured data can be found. "Vented and Sealed Attics In Hot Climates," A. F. Rudd and Joseph W. Lstiburek, Presented at the ASHRAE Symposium on Attics and Cathedral Ceilings, Toronto, June 1997. ASHRAE Transactions TO- 98-20-3. American Society of Heating Refrigeration and Air-Conditioning Engineers, Atlanta, GA.
"Unvented-cathedralized attics: Where we've been and where we're going," A. F. Rudd, Joseph W. Lstiburek, and Kohta Ueno. 2000. "Unvented Roof Systems," Joseph W. Lstiburek, 2001. 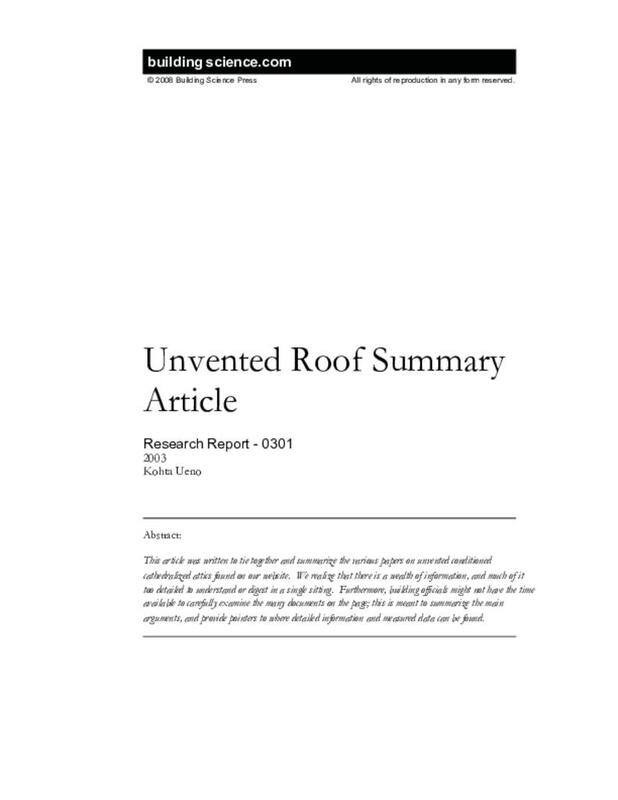 "Unvented Roof Assemblies or All Climates," Revised August 2008, Christopher Schumacher.